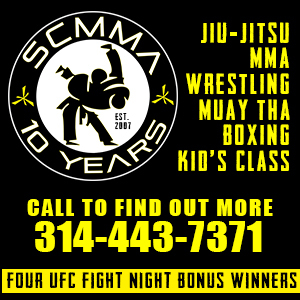 From the ashes of what was the former Horizon FC, which showcased some of the most entertaining amateur bouts the area had to offer last year, the newly revamped and rebranded Iron Fighting Alliance made its debut in the now familiar Sokol Gym in St. Louis. Iron Fighting Alliance is backed once again by the Scott brothers and joined by the Dalton's, owners of JD's Gym on board with a more active role. IFA is aiming to be a platform for amateurs to gain good experience and develop their skill sets before being able to be featured on larger promotions in the area. With promotions like Fight Hard seemingly on sabbatical from their all-amateur shows, the need for an additional feeder system of new talent is definitely welcome to the area. In the main event of the evening, Kevin Roper stepped up on short notice to fill a void against Freddy Kostjerevac. Roper has been on a hot streak lately, capturing two quick knockouts among his recent victories. Roper's experience showed early as he pressed Kostjerevac to the cage and landed some solid strikes, defending a takedown attempt and hitting some hard knees to the body of Kostjerevac. After a break from the clinch, Roper stalked Kostjerevac around the cage patiently as he waited to unload long and heavy strikes. Kostjerevac responded by looking to keep Roper away by using an assortment of different kicks. The second round picked up right where the first left off as Roper came out stalking Kostjerevac around the ring and using his range. A clinch in the open turned into a takedown attempt by Kostjerevac, who could not get Roper down, but Kosterevac was able to land some knees to the leg of Roper and hold position. In the third Roper earned an early takedown and Kostjerevac was able to get back to his feet, but found himself pinned against the cage. Kostjerevac was eventually able to separate, but Roper kept at his range and was landing patient and selective strikes. As the round was drawing to an end, Roper earned another takedown right before the bell. When it was all over, Kevin Roper was declared the winner by unanimous decision. Kostjerevac showed a lot of toughness and gained a tremendous amount of experience in the loss against Roper, who many believe is the top amateur middleweight in the area. Some early clinch work against the cage saw a trading of knees between Marvin Bowden and Aaron Kuhl. Kuhl fought a takedown attempt from Bowden and was able to turn it into a takedown of his own that saw him on top and able to land some strikes from side control. Bowden was able to get back to his feet, but Kuhl closed the gap and took him back down to the canvas right as the round expired. In the second Kuhl was able to get Bowden back to the cage and land a hard knee to the body, shortly followed by a takedown that got Bowden back to the ground and Kuhl moving to mount. Bowden turned and gave up his back as Kuhl looked to land strikes and try to create a finish. After another mount to back transition, Bowden was able to endure and got out of the position and end back up on top right at the bell. Kuhl got another takedown in the third, returned to mount, and then ended right up once again on Bowden's back. 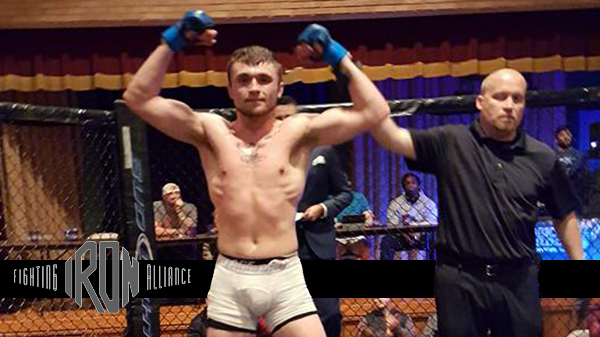 After another round that was similar to the second to close out the fight, Aaron Kuhl was declared the winner by unanimous decision. Jeff Houska got an early takedown off the cage against Erik Lutes, and from side control was able to land some knees to the body. Houska then moved to a scarf position with a headlock. From there Houska was able to trap an arm with his legs, leaving Lutes defenseless to his strikes, forcing a submission to end the contest and declaring Houska the victor. Back in action to polish up his striking skills, the streaking BJJ artist Jordan Meister stood across from Cody Nauke in K1 match-up. In what started as a slower and more calculated looking contest initially, Meister would secure a clinch and drop Nauke with a big knee to the body. After Nauke recovered enough to make the standing eight count, Meister did not let up and landed a kick back to the body as the round ended that caused Nauke to not be able to answer the bell for the second round. The HIT Squad's Meister would continue his current winning streak by TKO. Tony Folkers came out with a myriad of kicks against Farris Ward in the first K1 match of the evening. As the fight wore on, Ward kept pushing forward and finding successful moments of landing effective strikes. In the second round, Folkers appeared on tired legs and Ward sensed a finish as he pinned Folkers in the corner and unleashed a barrage of punches until the referee stepped in to stop the bout, earning Ward the victory by second round TKO. Eugene Swartz shot in early against Matt Kruetzman, and after getting the takedown the two traded a handful or reversals before Kruetzman ended up on bottom and set up a triangle choke. After maneuvering position to create a better angle and landing a few strikes, Kruetzman locked in the submission and forced a tap from Swartz, making him the winner by first round submission. Suda Salkic and Arnold BJJ's Thomas Coghill spent the first portion of their bout trading punches back and forth, much to the delight of the crowd. The energy and pace was high, and then Coghill secured a takedown and was forced to defend a guillotine from Salkic. The fight got back to the feet right as the round ended.The second round started much like the first as the two were trading back and forth until Coghill secured another takedown. Salkic did threaten an armbar, but could never quite find the space to bring the leg over and finish the attempt. After landing a nice combination to start the third round, Coghill got another takedown and in the transition to the mat moved to mount. From that position he was able to posture up and throw strikes until referee stoppage, making him the winner by third round TKO. In the first MMA match of the evening, Jake Willyard secured an early body lock takedown against Kyle Ondo, and threatened a guillotine that looked extremely tight. Ondo was able to endure, shrimp back to guard, and then lock Willyard up a triangle. While Willyard never tapped, he did go out and Ondo was declared the winner by first round submission. Nathan Stearns secured two submissions over Calvin Williams in an exhibition grappling contest to lead off the night.